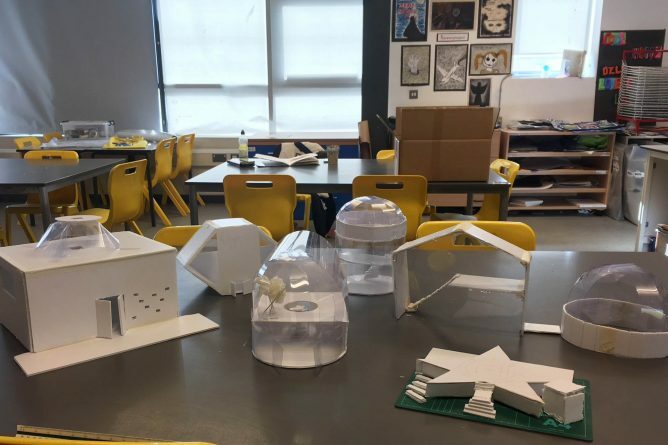 As part of the Outreach programme which the Kent School of Architecture runs, we made four trips to Community College Whitstable where we introduced the subject of architecture to a class of Year 9 Art students. In our first two sessions we discussed the principles behind architectural drawing to the students, before introducing them to their brief – to design a café with a view on the Whitstable Harbour Arm. Working in groups of 3 to 4, the students quickly started playing with ideas by sketching them and by exploring existing precedents. By looking at projects such as underwater hotels and roof-top gardens, the students soon realised that the possibilities of architecture went beyond what they had originally thought. In the third session, we introduced the students to the idea of working to scale and with this in mind, tasked them with making a 1:100 scale model which would showcase their designs. We provided them with white card, acetate, foam board and paper and the designs soon came to life which the students all seemed to really enjoy. Although some of the students needed encouragement in their abilities to design and model-make, they all pushed through and produced a variety of exciting and unique proposals. The model making continued into our final session, at the end of which, we asked them to present their work to the rest of the class, which they all felt confident in doing. During our time there it was great to also talk to the students about studying architecture. Although they were only 13 years old, they were curious about the route to becoming an architect, as well as our current MArch work. They spoke to us about their personal experiences and interests in the field, and there were a few students who were genuinely interested in pursuing it in the future. Overall, we were truly impressed with the students’ creativity, outcomes, and interest in the subject. We both agree that we would have enjoyed a workshop like this at their age, as neither of us had the opportunity. We hope the students have not only learned about architecture as a potential career path, but also about group-work, the design process and confidence in their abilities and ideas.